we demonstrate how fast, simple, and easy it is to use a pressure cooker. We prepare 7 recipes including chili, Bar-B-Q Ribs, pork, chicken and rice, bake bread and even make a cake. ALL in our pressure cooker! And, demonstrate some of the procedure used. Running time: Apx. 97 Min. This video was shot entirely aboard our 27 foot sail boat. In it, we provide a short “Tech Talk” regarding the pressure cooker and some hints about what you might want to look for if you still need to purchase one. We then use our pressure cooker to prepare 7 different recipes, including beef, chicken, and pork, we even bake bread and make a cake for dessert. During the preparation of these great tasting meals, you not only get the recipes, you are also presented with our practical usage of the cooker. We have met many people who have said they do not use a pressure cooker because it's “too hard”, “too dangerous”, “too Mysterious”, or “too complex”. Let us help take the mystery out of using a pressure cooker. 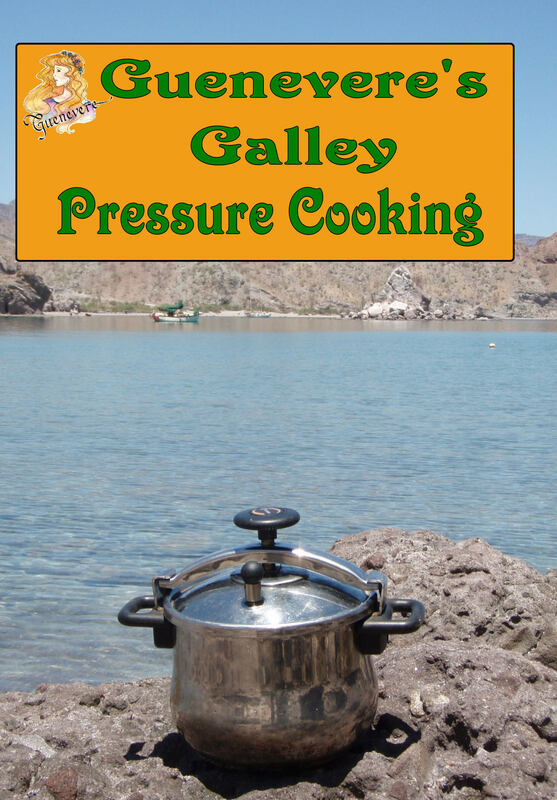 Using a pressure cooker, aboard a small sail boat, or in a large home kitchen, is fast and easy. As a matter of fact, the only mystery we have concerning a pressure cooker is why it is not the main utensil in every galley! You will love the recipes presented, though they are only a starting point. We would love to see each of you modify them to suit your own unique taste! These recipes get you started. Make them, modify them, make them your own! We have no background in the movie industry. Our ONLY movies up till now have been home videos. During our travels we have been taking a LOT of photos and videos. We were looking for a way to share some of the unbelievably wonderful and beautiful sights and scenery with some of our family and close friends. One day we met a gentleman in La Paz who had made a cruising video some years back and he suggested we look into doing one ourselves. So now, these DVDs are not only for our immediate family, we are now able to share them with you. Let me provide you with a little bit of information about what our cruising videos are, and are not. First, these videos are not Hollywood productions! We have no studio, or sponsers behind us. Our DVDs are multimedia presentations of real life cruising by us, real people, living a lifelong dream to retire to tropical, warm, clear waters and experience the real wonders the world has to offer. What you get to see and hear is as close to what we saw and heard as we could make it. Second, we are NOT expert cruisers and these are not "how to" cruising videos. They only show how and where we have chosen to cruise. By “multimedia” we mean they contain video, still photos, original sound, and at times a narration and/or sound track (music), that we have added to make it more interesting. We have taken every opportunity, and every resource available to us to make them as interesting and fact filled as we can. We are proud to say that these videos were taken on board Guenevere our Nor'Sea 27, or by the two of us during some of the shore excursions, during the travels in the video. We used a home digital video camcorder and a digital still camera. The images were then transferred to our on-board laptop computer where they were edited, and the final master DVD was produced. We hope you enjoy watching this DVD and find it informative and enjoyable. If you do, please let us know by email, we would like to hear your thoughts. These DVD programs were financed by us with no sponsorship or outside funding. It should not be copied, shown for gain or reproduced electronically without permission. Please help us regain our cruising kitty by encouraging your friends to purchase their own copy. As we heard some time ago: The boat is our “bedroom”, the world has become our living room!